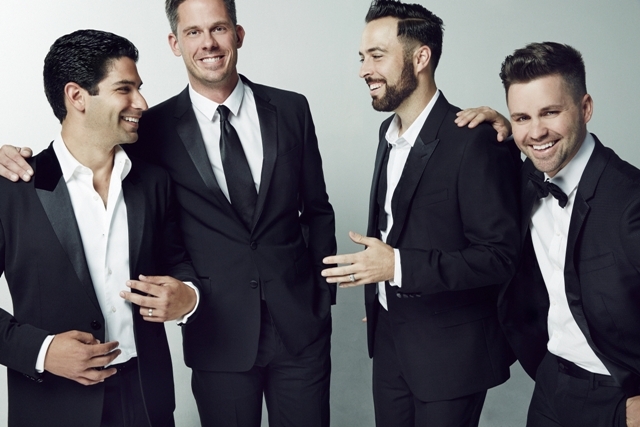 The Company Men consists of members, Stuart Ambrose, Shawn Perucca, Brian Purcell and Daniel Tatar. They eloquently mashup yesterday and today’s biggest pop hits to create their own “throwbackPOP”. 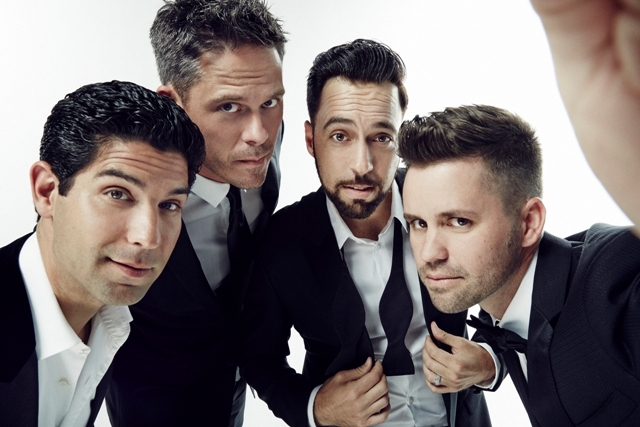 These modern gentlemen offer today’s sound with influences from the past six decades. You all seem to have amazing chemistry! How did you first meet and what made you decide to start this group? TCM: The group was founded in a hot tub off the Vegas strip. True story! Sort of… We all had 9-5 jobs at the time, but on the side, we were performing with a Frankie Valli and Four Seasons tribute group. We were getting ready to do a show that night, and were sitting in the hot tub together kind of day-dreaming about starting our own group and doing our own thing. From that hot tub “meeting” we created the name, the basic throwback concept, and had even purchased the website. For us, this has always been about two things: supporting our families and making a living doing something we love. We’ve been so fortunate to be able to do that for several years now. How did you come up with you group name? What were some other names you were considering? What are Company Men exactly? TCM: We each had a different day job. Brian was an executive recruiter; Daniel was a website designer and stay-at-home dad; Shawn worked for a theme park, and Stuart was in the military. We had all these corporate type experiences, and the name just grew out of that. To be honest, those business skills have served us really well in the group over the years. So, we embrace our various pasts in a big way. I am not sure if there were any other names we were considering. Words like “modern” and “gentlemen” kept coming up, but in the end we felt the best description of who we were was The Company Men. As far as who we are, for us, our brand is both throwback and current. It’s not one or the other, but both living side by side. And isn’t that what we see around us every day? It’s almost like that new piece of cutting edge technology that has been designed to look like it’s from 1955. We love that. We’re kind of the musical version of that, if you will. It’s in our clothing too. We wear custom shoes by Cobbler Union and recently added some signature pocket squares by Armstrong and Wilson. They’re throwback, and we love it. When we mash songs together, like when we take a song from the 1960s and pair it with a Top 40 hit of today, we want our audience to experience the nostalgia of when they heard it for the first time, and we also want them to feel like they could hear it on the radio today. It’s the best of both worlds. Perhaps more importantly, the COMPANY MEN are about bringing back some of the gentleman values from a previous generation. Words like honor, integrity, honesty and respect have real meaning for us. It’s about being a true modern gentleman. 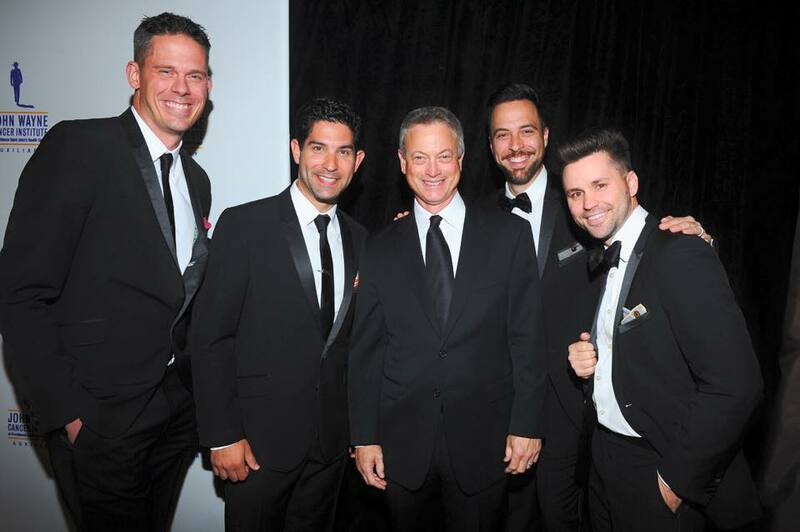 What was it like meeting Gary Sinise and performing at the John Wayne Cancer Institute’s 30th Annual Odyssey Ball earlier this month? Mr. Sinise is the epitome of a gentleman in every sense of the word. His work for charity organizations, like the John Wayne Cancer Institute is legendary, and he serves as a model for entertainers of all sorts for how to conduct themselves and use their positions of influence for positive change. As for performing for the Institute’s 30th Annual Odyssey Ball, we had a great time supporting such a terrific organization. Cancer touches so many of us; we have had and continue to have several family and friends who are battling this horrible disease, and it is because of the efforts of organizations like the John Wayne Cancer Institute that they can continue to fight. The research that they fund is truly invaluable. With all the experiences you guys have had lately, what are a few other moments that have really stood out? Actually, the night we performed at the Odyssey ball was a huge recent highlight for us. Not only was Gary Sinise in the audience, but also the singer-songwriter Pink and many of the Wayne family. We had been asked to perform one of the songs from our new album called “Standing Strong,” and getting to perform one of our original songs for that audience was a huge honor. How has your ThrowbackPOP Tour been going? Any favorite venues or crowds yet? It’s been going extremely well. We’ve got an amazing tour sponsor in Global Cash Card and we’ve been able to perform all over the country. One of the most fun parts of the tour has been seeing how the show works in all sorts of venues. We did a great show at the end of last year in Warren, Ohio in a huge old performing arts venue and then a few weeks later got to the show at Feinstein’s at the Nikko in San Francisco – a small intimate club. In some ways, it’s a completely different show when we scale it up or down. Both types of shows are fun, but in very different ways. This month, we’re excited to take the tour to Canada for the first time with a week long run at the Fallsview Casino Resort near Niagara Falls. We’re playing their main 1500 seat showroom. It’s going to be exciting! What are your favorite songs on your debut album? What songs do fans really get excited about? Probably, “I’m Taking You Home” and “Crawling Back” are the biggest fan favorites. Obviously, we love “I’m Taking You Home” as that was the first music video we decided to produce from the album. It’s a lot of fun, and audiences love it. It’s much more of a stripped down arrangement than we’re used to, which is one of the reasons it’s had such a positive audience reaction. “Crawling Back” has also gotten some radio play around the country which is exciting. There are so many great artists out there whom we respect – so many great performers who are making their mark. People like Tori Kelly, Rozzi Crane and Todrick Hall are artists we know that are writing and creating great material. We love to work with people like that. Are there any pop songs that you have yet to use but hope to soon in new mashups? There’s a strong chance Bruno Mars’ “Uptown Funk” will be making an appearance in the show very soon. What are some of your all-time favorite pop songs? What do you think of pop music today? Almost too many to mention! That’s why we do mashups and our show includes over 45 songs. We can never choose just one. Clearly, we’re partial to some of the greats – songs by the Temptations, Michael Jackson, U2 and others. As far as music today is concerned, we tend to be attracted to artists and songs that have a throwback vibe. Bruno Mars is great at that as are many others. It’s the current song on the radio that has that 60s, 70s, or 80s feel that we tend to think is really fun. What’s next up for you guys? More mashups or more original material or both? A little of both actually. We are working on a few new mashups, specifically an 80s rock mashup and an Americana mashup, and we have a few original tunes that we’re looking at right now from some great song-writing teams. It’s going to be another exciting year! Q&A with MILKY CHANCE – Coachella 2015 Edition!